I suppose my big news centres around two visits to medical professionals. First up was my physio and she is very pleased with my progress. However, in rolling over on her table I got a very strange sensation in my groin / pelvic area. Not in a sniggering way! This has happened before and its very odd, as when I lie face down my pelvis just doesn’t like it. Its not painful – its just very uncomfortable. A quick and slight shift in position and its gone. Anyway, she went through my medical history, including a torn groin from a gardening incident, another tear after an slip in the rain on a cricket field in Romiley, at which point the only available sub was a cider filled Andrew Atkins, and of course a double hernia operation. ‘Aha!’ she said. Its probably your psoas muscle. Well that was news to me. Never even heard of it. I certainly couldn’t put my finger on it, fortunately she could! Exercising the psoas is all a part of core stability, and its very difficult to isolate. Ended up being sorry I ever mentioned it. Still, at least the knee is holding up. My second session was with my consultant who has effectively signed me off until December. He took some more x-rays and showed where the bone is healing. Quite impressive, though he did remind me that it is still early days. He then again explained that after 12-18 months he would take out the plate, so that if I need a knee replacement in 15-20 years time it would be much better fitted to a fully healed bone, and they would have to take the plate out anyway. He also showed me another remarkable phenomenon. The realignment of the knee has seen the pressure on one side relieved, and this has led to the growth of new cartilage, which is a very positive sign. Before I had the high tibial osteotomy he told me that for six weeks after the operation it would be very frustrating and more than a little uncomfortable, but after that I would see genuine improvement. He was absolutely right. So there you have it. I had the operation done in the hope of 10 extra years of active life in the joint, and now he suggests its 15-20 years! Happy days. So I celebrated by cycling to Marple and that could have been a mistake. I was ok physically, but it was very, very muddy. The bit past Swizzels is muddy in the height of summer, so that wasn’t a surprise but some bits around Strines were a real bog. Still, the coffee at Costa made it all worthwhile. Got my laptop back, and as feared they had wiped it. I got the data back on without too much trouble but feared the rigmarole of resurrecting licences from Microsoft etc. Actually it was surprisingly easy Maybe this licensing is just a pretence, and anyone can download anything as long as they have a key! There haven’t been many blockbuster movies recently, in fact since the days of Armageddon and Independence Day there haven’t really been any ‘America saving the earth’ pieces of sheer escapism. So I watched San Andreas hoping that it would fit the bill. I was sadly disappointed. Absolute utter garbage. I would rather believe that Will Smith could fight aliens than this far fetched nonsense. If you get chance to watch it – just don’t. I went to the Plaza in Stockport last weekend, to watch Frankie Boyle. Its a long time since I’ve seen him, and he didn’t disappoint, though he finished rather early. At around 9.15 he said ‘thanks and goodnight’, and it was so early that many of us stayed in our seats expecting, at the very least, an encore. But it wasn’t to be, and I suppose the art of a performer is to leave the audience wanting more, which he duly achieved. Much better to do that than to suffer at the hands of Jason Manford at the Buxton Opera House. Jason is a funny guy, but he just went on and on and on! Anyway, the Plaza is a really good venue for comedy. Hoping to see more there soon. Had another cycling trip to Marple, and this time it was much easier. Hardly any mud (except around Swizzels of course), and although its still tiring I managed to get there in around 45 minutes. I think the next step is to actually do some running, possibly emulating a cricket match, but that’s not likely to happen any time soon! This week the highlight of the kitchen was Zac’s cereal bars as a part of his food tech homework. It was quite easy, and actually he did most of it. Oats, honey, syrup, butter, raisins, nuts and pumpkin seeds were all mixed together then baked. The result was quite tasty, so he cut them up, wrapped them, and stuck labels on them ready to take to school the next morning. I know what you’re thinking, and no he didn’t forget them. Unfortunately the mixture set into a rather hard bar, and although he found a softish bit to give to his teacher he actually threw a whole bar at the wall and it didn’t break! Ah well, back to the drawing board. I also managed to make the topping for the Creole cake. Marzipan decorated with gingerbread stars looked quite good, though at that point the stars were a bit firm, and I hoped they would soften in storage. A week or so later the great unveiling happened at my mum’s and we had a piece each. To be honest I’m not sure that I should have driven home afterwards as the brandy, port, rum. bacardi, cherry brandy and angostura bitters kicked in. It was very moist and flavourful, and has proven to be very popular. 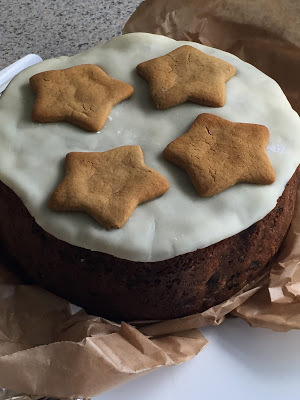 Definitely nicer than the traditional Christmas cake, and the stars had indeed softened to give a nice gingery touch. If you want a piece you had better be quick – it will be gone by Monday! I guess I’ll just have to make another one, and I think I might experiment with an orange theme as we have a rather full bottle of Cointreau in the dining room! I’m off to Cuba next week, which of course means that when I get back I won’t have any holidays booked, and that just won’t do. So, I booked a week in a villa in Malta in August. Flights are still quite cheap from Manchester and the villa has a pool and all mod cons. Should be nice, but I am leaving it to the villa owner to book our hotel transfers as the journey from the airport to the villa involves about 40km and a ferry. Past experience of driving abroad tells me that without this assistance I would probably end up throwing Sally off the ferry, or vice versa, assuming that we could find the ferry in the first place. Anyway, a week in Malta will clearly not be enough, so the following week we are off to Killarney races, flying to Cork and staying at a very nice spa hotel for a couple of nights. No kids – woohoo! My third trip to Marple followed the road as far as Disley, avoiding the muddiest parts of the canal. and I made the discovery that Whaley Bridge to New Mills along the A6 is actually uphill. Not dramatically uphill, but enough to make a difference on a bike. Anyway, I got as far as Redhouse Lane and joined the canal just short of Disley. From there it was an easy ride into Marple, and the traditional Cortado at Costa. For the return trip I decided to try Strines Road, and for the first couple of miles it was great. Occasional slight downhill slopes followed by a steeper fall when I could get up quite a bit of speed. Then I reached the outskirts of New Mills. I didn’t realise that hill was quite so steep. It took some climbing, but I made it, and then headed for Swizzels and the comfort of the towpath, It took a bit longer than the usual 45 minutes, but after 3 challenging cycles in quick succession there were no adverse effects on my knee. The spectre of running is starting to loom large. Maybe in Cuba! And speaking of Cuba, Zac asked if it would be full of posh people. I asked him what he meant, and although he didn’t fully explain he did admit, ‘I don’t like posh people. They are too serious.’ He then asked about where we are staying. Zac is now really looking forward to Cuba!